By Road: Please note, there are two entrances to New Hall School. The directions below take you via White Hart Lane and the main entrance to our campus. An alternative access road runs from Generals Lane at the east of our site via the New Hall Lane entrance. Satellite navigation systems could take you to either entrance when using our postcode CM3 3HS. The postcode CM1 6GY will take you via White Hart Lane. From the A12 (London or Ipswich) leave at Junction 19 and follow the signs for A130 / Stansted Airport. At the Sainsbury’s roundabout, take the second exit onto White Hart Lane. 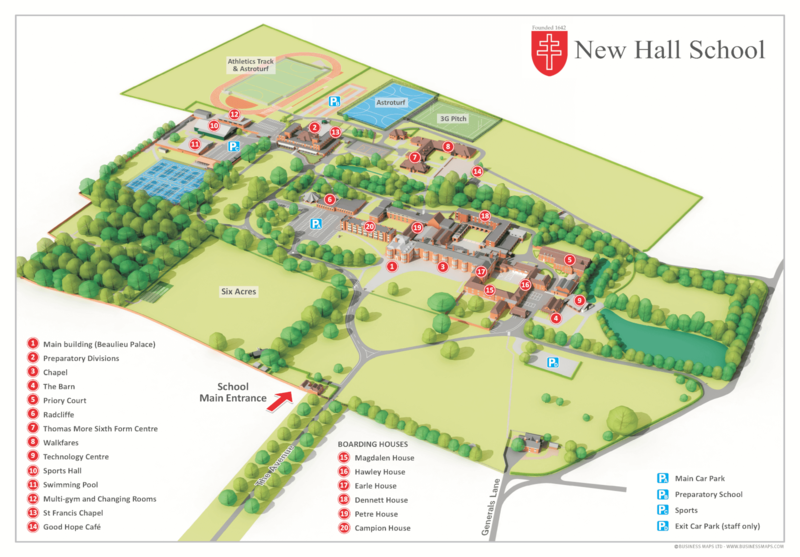 The entrance to New Hall is on the right and is accessed by going to the next roundabout and coming back on yourself after 350 metres. From Braintree / Stansted on the A130, once you are nearly at Chelmsford, you will arrive at a roundabout signposted left for the A12, Boreham, Chelmer Village & Witham. Take this exit and continue straight over the next two roundabouts. The entrance to New Hall will be on your left just before the Sainsbury’s roundabout. By Rail: Chelmsford railway station is a short drive from New Hall School. It is on the main London to Norwich line. Chelmsford is just 30 minutes from London Liverpool Street. Trains run every few minutes during peak times. By Air: London Stansted and London Southend airports are within 40 minutes drive of New Hall. Gatwick and Heathrow airports are around 1 hour 30 minutes drive away. All London airports have regular flights from around the UK, Europe and international destinations.